Posted on Mon, Feb 20, 2012 : 6:49 a.m. The party’s in full swing, and by party, I mean the ultimate party: Mardi Gras, that crazy festive season before Lent when participants joyfully embrace every available form of Bacchanalian debauchery, culminating in a Fat Tuesday flurry of I’ll-repent-tomorrow paczkis. I loved being in the thick of Mardi Gras when I was a teenager, but I much prefer the slower pace of New Orleans in off-season when traveling — and I can always enjoy their food. 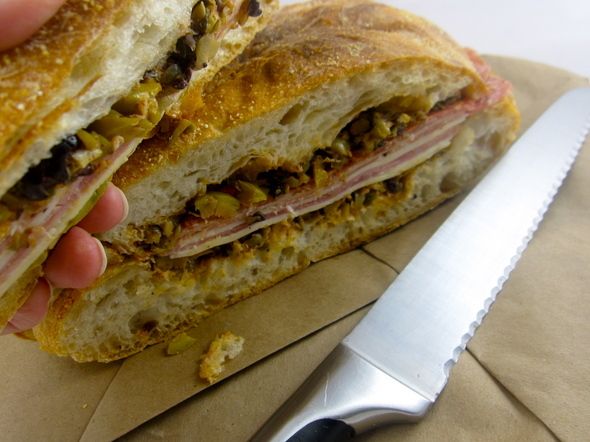 If you can’t make it to Central Grocery on Decatur Street, to pick up a Muffaletta — the sandwich that defines the city — here’s a recipe I make right here in Ann Arbor. I couldn’t find the exact bread they use (a thick sesame-topped Italian-styled bread) but Zingerman’s Paesano, to my tooth, is preferred. Click here for a slide show of my Louisiana kitchen favorites. 1. Slice the bread in half horizontally, and remove 1/2-inch of doughy inside bread to make room for the fillings. 2. Spread 1/2 of the olive salad and its oil on the cut edges of the bottom piece of bread. Layer meat and cheese on top of the olive salad. Spread remaining 1/2 of olive salad on top of meats. Place top of bread, cut side down, over bottom half to make a sandwich. 3. Wrap in plastic wrap and refrigerate, weighted down (bricks, a heavy pan or cans work well), 2-6 hours before slicing into wedges. In a food processor, pulse ingredients together until coarsely chopped. This is a chopped salad and should not be purÃ©ed.